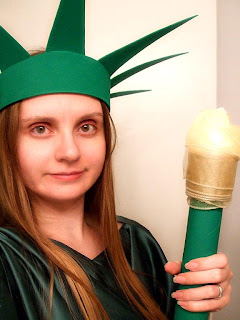 I've always wondered, does Lady Liberty wear a brassiere? Does she really believe in Freedom for All? Or is she more about uplifting symbolism? Is she a Feminist? Does she shave her pits? (She is a French immigrant, after all.) Or is she a stay-at-home maternal figure, on vigil for her prodigal children to return home from abroad? Questions I've long harbored (no pun intended) but never had the chance to ask before. Well, THIS Lady Libery did indeed shave her pits and wear a bra that night ;) However, the actual statue is wearing a traditional style of Roman dress-- a two-piece number called the stola and palla-- that came long before the invention of the brassiere. There's a way of wrapping the straps of the stola undergarment that does provide some support for the girls, though. It's actually a rather clever system, which is not surprising, given it's Roman. You know, it wouldn't have killed you to crop that picture about twenty pixels lower. I wish I had the wherewithal to watch tv more often - I would so watch The Report. bleah. stupid no-tv-time-having life. sigh. but your costume is INCREDible. how are you such a genius and still real? I'd like to know. really. Well, I don't know whether obsession with random esoteric knowledge actually equates to genius. Especially since I'm not even that good at being obsessed with esoteric knowledge-- I usually lose to my smart friends at Trivial Pursuit. I watch the Report the day after its first airing, when it repeats at 7:30. So I'm always getting my news a day late. And even then I really only manage to catch it maybe three times a week, and I often only see part of the show. So it was a lucky thing I managed to catch this moment of surpassing beauty.